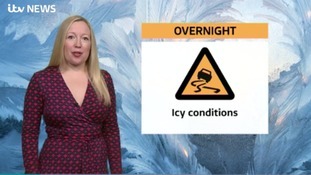 West Midlands Weather: The wet and windy weather will clear with risk of ice developing. East Midlands Weather: Mainly cloudy but most parts dry. West Midlands Weather: Mostly cloudy overnight, then brightening up tomorrow. Feeling breezier and cooler, with outbreaks of rain through much of the day. A cloudy day with bands of showery rain spreading northwards, perhaps heavy for a time during the afternoon. After a frosty start, the West Midlands region will have a completely dry day with plenty of sunshine. A clear, cold and frosty start, then a dry day with plenty of sunshine, and feeling rather pleasant with light winds. Viewers have been sending in their photos of snowy scenes across the East and West Midlands. The wintry conditions are expected to continue into the weekend as Britain faces unusually cold weather for the rest of the month. A yellow warning of snow and ice will be in place across parts of the Midlands on Monday evening.